LEN - www.lankaenews.com | One president , one session but anthem repeated thrice ! Nothing new, nothing envisaged in Raalasana speech – damp squib..! (Lanka-e-News - 10.May.2018, 11.00PM) The inauguration of parliament with much pomp and fuss after the prorogation only turned out to be a meaningless waste of time and public funds only , and had nothing new to offer, bemoaned JVP M.P. 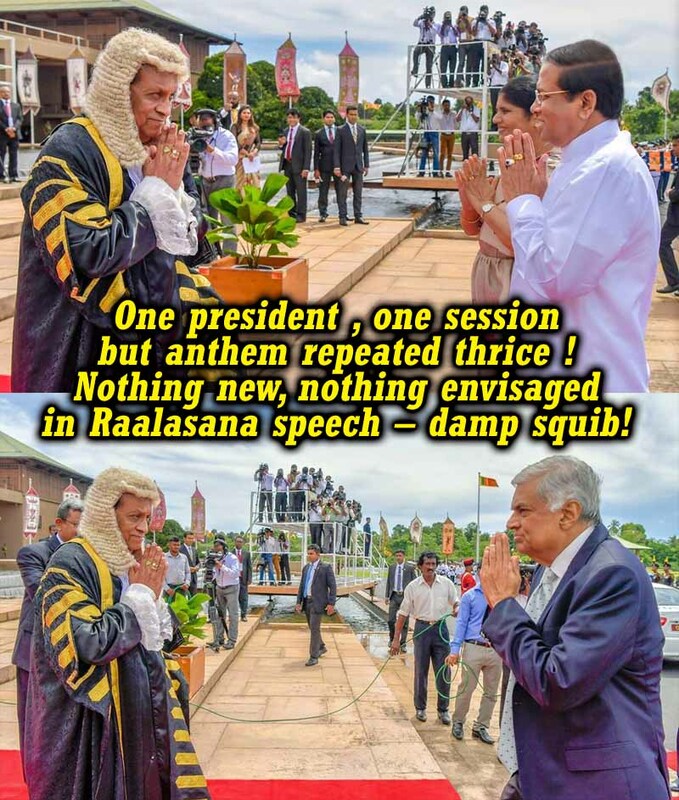 Bimal Ratnayake, while adding that he is wishing to question the speaker on how much public funds were wasted on this fake inaugural celebration which was a damp squib. By this rigmarole , it is only about a thousand oral questions that were to be asked , and about a thousand petitions got postponed , Bimal further lamented. Even the UNP was not aware of the prorogation and the inaugural parliamentary session.. That was a unilateral decision of the president. Mind you even the gazette publication in that regard could not be printed properly. There were outrageous blunders which necessitated it to be printed thrice. It is a pity , poor Pallewatte Gamarala the president , had to arrive in parliament for the inaugural session while his reputation was in tatters immediately following the bribery scandal involving Rs.100 million tainting him, and after getting trapped while collecting Rs. 20 million through an assistant of his as advance of the promised total bribery amount of Rs. 100 million. President ,the Gamarala now turned internationally infamous ‘Pagaarala’ arrived with a glum and morose face ( much worse than his usual grumpy look) with his entire self smeared by the corruption scandal . He did not smile or speak with the ministers and MP’s, neither did he participate in the tea party . President Gamarala was accompanied by his wife when he arrived to inaugurate the parliament session. Of course his wife just came and just went. This was most conspicuous because P.M. Ranil Wickremesinghe came alone . The national anthem being sung three times at a single State function was not only funny but even weird . As though there was nothing better to do at Gamarala’s much hyped inaugural session, the national anthem was sung twice while Gamarala stood still like a monument , and again at the concluding stage it was sung again. Any addition to perfection is a diminution. This anthem being sung excessively degraded the anthem , and the function .Perhaps Gamarala does not know even this simple truth. Even the inauguration ceremony turned sour for Gamarala. The 16 parliamentarians he lost by trying to expel P.M. via clandestine methods and conspiracies , sat in the opposition that same day . At the end of the ceremony a tea party was thrown on behalf of parliamentarians , but it was very few of the president’s SLFP team attended it. President was a pitiful sight. He looked a distraught ,disappointed and disillusioned leader with suicidal thoughts after having driven himself voluntarily into the thicket of corruption , bribery and blunders of which he is the architect. This photograph depicts the speaker welcoming president and Prime Minister when they arrived for the parliament inaugural session.